This thread has the capacity of being the best barn find ever! 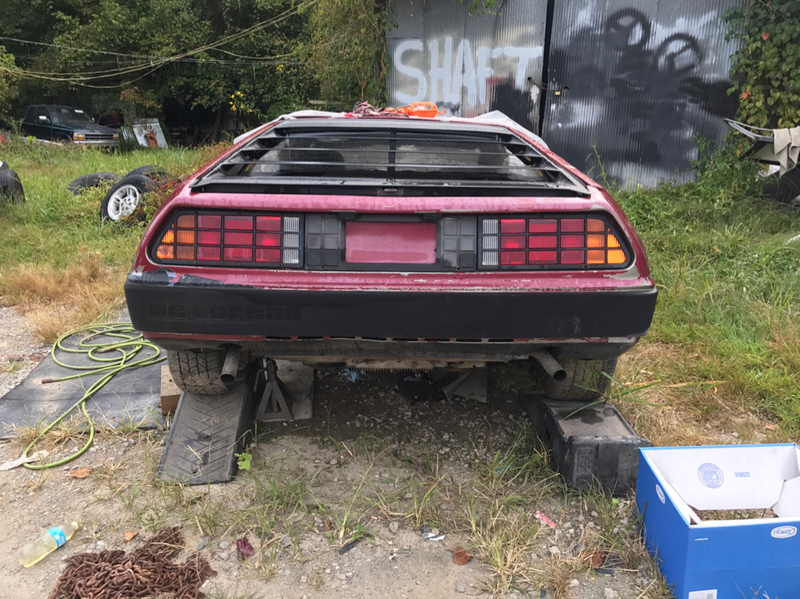 A running DeLorean for 4 grand???? Sure it needs work but it actually runs for 4k??? Word to the wise, don't push your luck. Don't run it anymore until you do some research on returning cars that have been parked to the road. That car will still need a LOOOOTTT of work! What is the VIN of this gas flap beauty? Oh I didn't buy this forgotten baby (yet) my wife and I are figuring it into our budget and it would take aloooooot of $$$$ to get it ready to (Fly) again lol! What got me was why the hell did they paint it magenta? He said because it looked prettier! No!! Nice find. I echo the opinion on not running it long... or again until the system is cleaned out. At $4k its a buy anyway. Plus, the shed in the back is owned by a man who would give his life for his brother man. Can you dig it? That depends on your level of what you believe Restored is. I can tell you that if you look at my build thread I did most of the work myself and have well over 35 into my car. I also bought a barn find. Mine didn't run and I paid 10 grand for it but it was an excellent restoration candidate. I would say for 4 grand a running car is worth snatching up. You could do minor stuff to it and flip a profit if that's what your into. But be ware that even though it runs for 4 grand....itll need significantly more to be a driver. Especially if it's been outside like that. But hey I am all about it . Pretty much any car can be brought back from the dead. My car was definatly a lost car that would have been dead if it wasn't for me . If I were buying it for myself I would ballpark 10-13k to make a decent looking driver and that's me doing most of the work myself cosmetically. I could be off a mile either way but I feel that number would give me a comfortable margin of error before making an offer. I am also factoring in that the panels are fixable and able to be returned to stainless. One trashed left fender could blow my estimate off quite a bit. Last edited by Michael; 09-12-2017 at 11:21 AM.